I’m going to take a guess here and assume that just about everyone has eaten their fair share of those styrofoam noodle cups with the dehydrated veggies and ramen noodles. When I was growing up we usually had a few tucked away in our cupboard to have as an after-school snack. Now I kind of cringe just thinking about the ingredients in those noodle cups! I have long since ditched them in favor of much healthier and more delicious noodles that are nutrient dense instead of empty calories. That’s a win-win in my book. 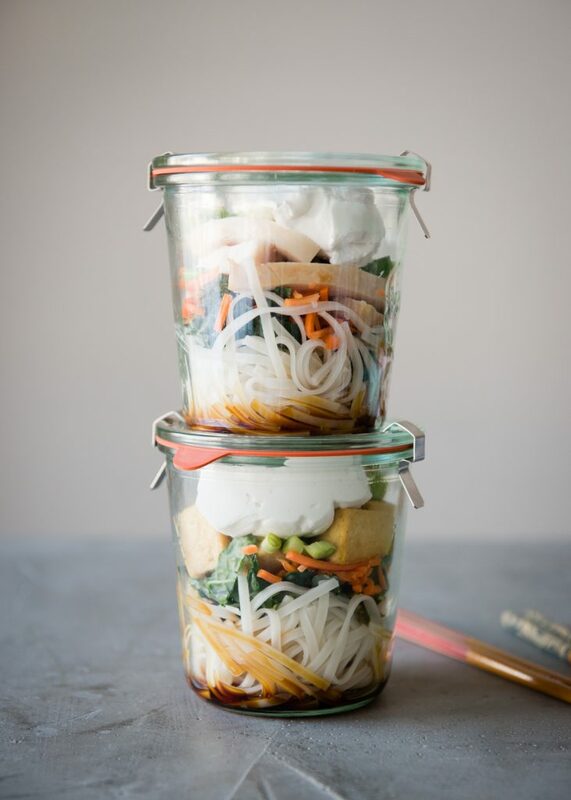 This Take-To-Work Noodle Jar is not just super easy to make, but easy to transport as well. 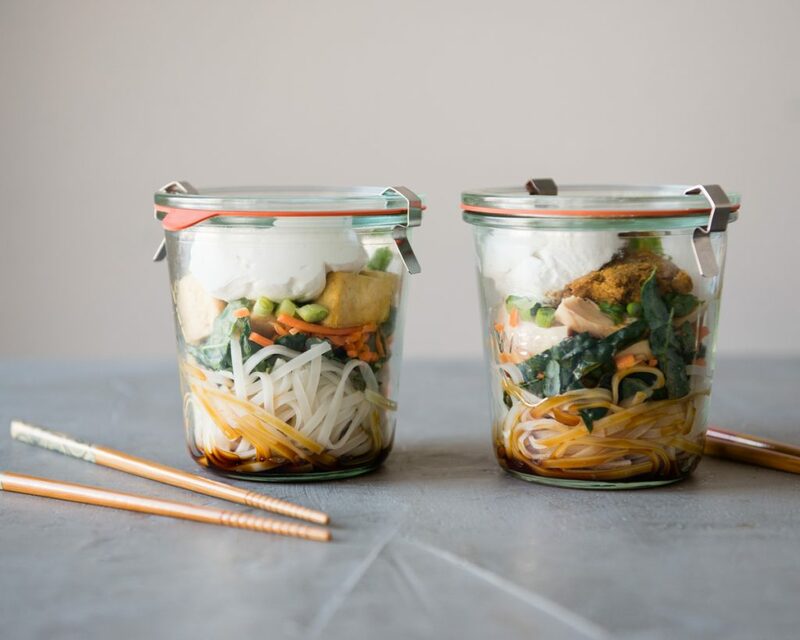 In case you haven’t seen these popular noodle jars before, the idea is simple: add whole food ingredients to a jar, take it with you, pour in boiling water, let it sit for a few minutes, and bam! You’ve got yourself a mighty fine lunch. 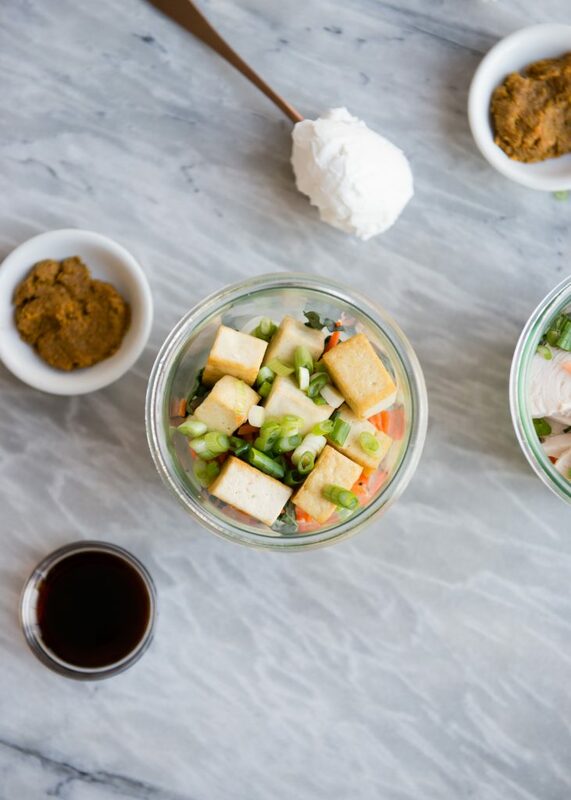 Because I’m a huge fan of Thai food, I like to make noodle jars with Thai curry paste and coconut cream in addition to the noodles and veggies. They’re kind of like a mix between Pad Thai and coconut soup. In other words: perfection. The noodles I like to use are rice sticks, which are the same ones used in Pad Thai. They need to be softened in very hot water before assembling the noodle jars. Feel free to use your favorite kind of noodles in place of the rice sticks. I’ve even made these with spiralized zucchini as a low carb option with great success. I use raw veggies, but you could use leftover cooked ones if you prefer. The protein should definitely be cooked and cooled before assembling the jars. I love adding simple pan-fried or baked tofu. 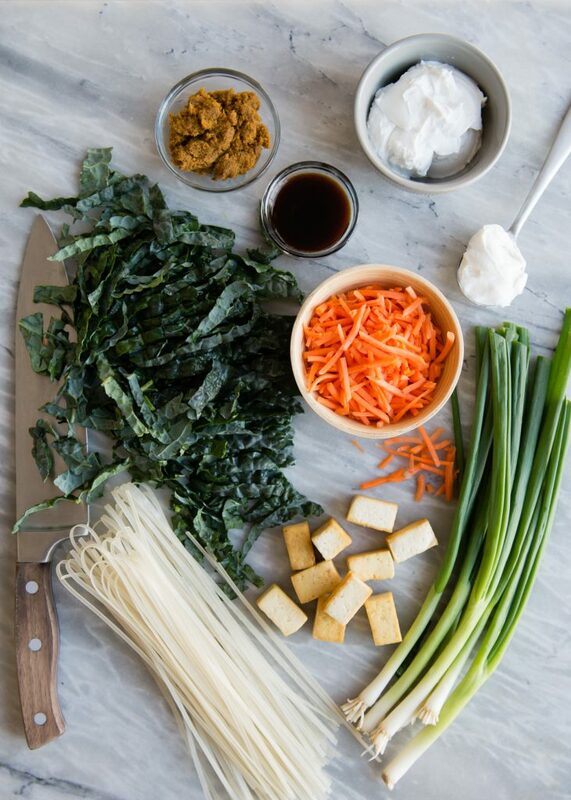 (The tofu in the pictures is a high-protein, extra-firm tofu available at Trader Joe’s.) You can substitute mushrooms, tempeh, seitan, etc., for the tofu. Whatever you like best! The layering part is very easy. As the photo above shows, I start with the noodles in the bottom of the jar and add the other ingredients, finishing with the flavor elements. The tamari (or soy sauce) is there to add a little more depth of flavor and salt. The coconut cream adds richness to the broth and tastes great too. And after that, the jar goes into the fridge until lunchtime. It’s nice to have healthy, flavorful options to enjoy for lunch. 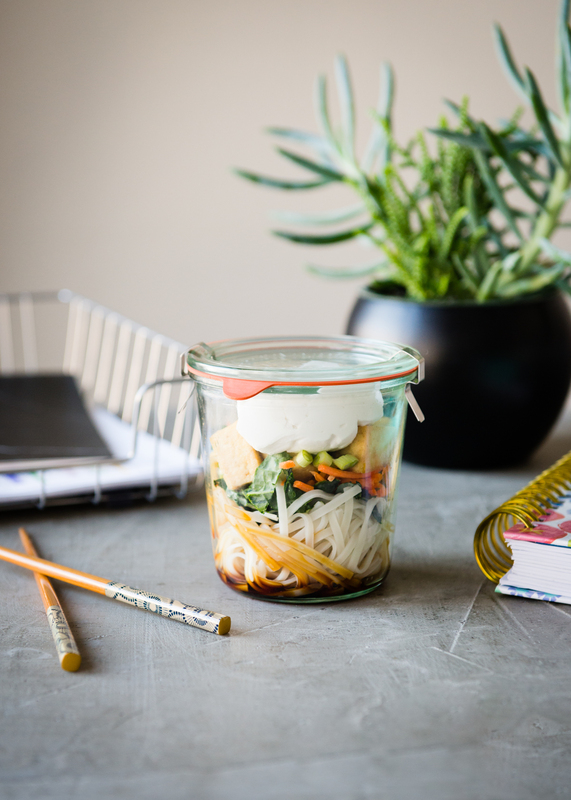 Besides this yummy noodle jar, I am also a huge fan of our salad jars. 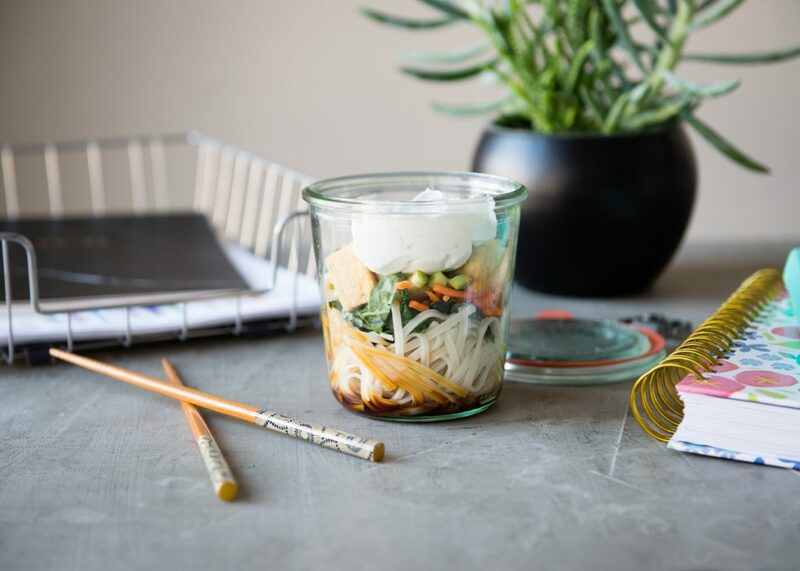 This easy-to-make and easy-to-take noodle jar is perfect for a delicious, healthy lunch. Just add the ingredients to the jar, take it with you, and add boiling water when you're ready to eat. 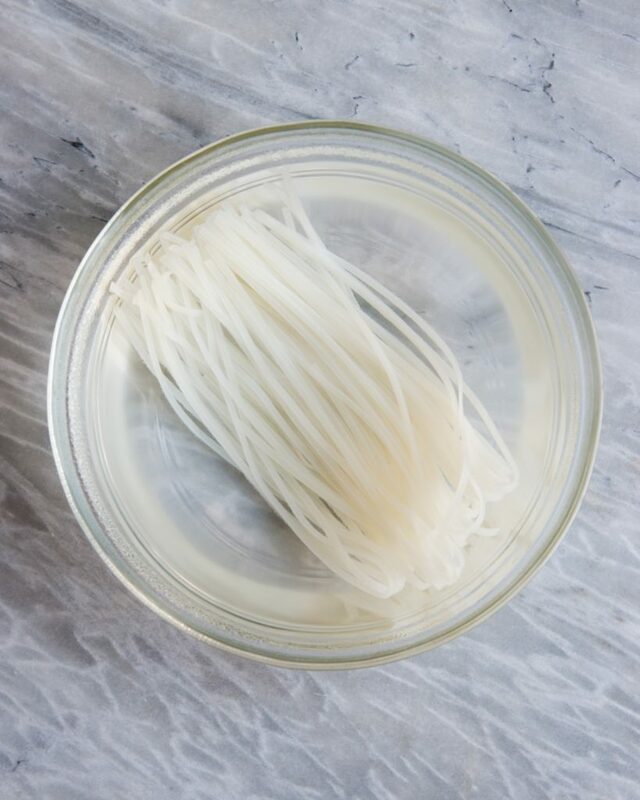 Place the dry rice sticks (noodles) into a medium bowl. Add 2-3 cups boiling water to cover the noodles. Let stand 8-10 minutes, or until softened. (Note - when the noodles are softened they shouldn't be mushy, but will be more al dente.) Drain and rinse in cool water. 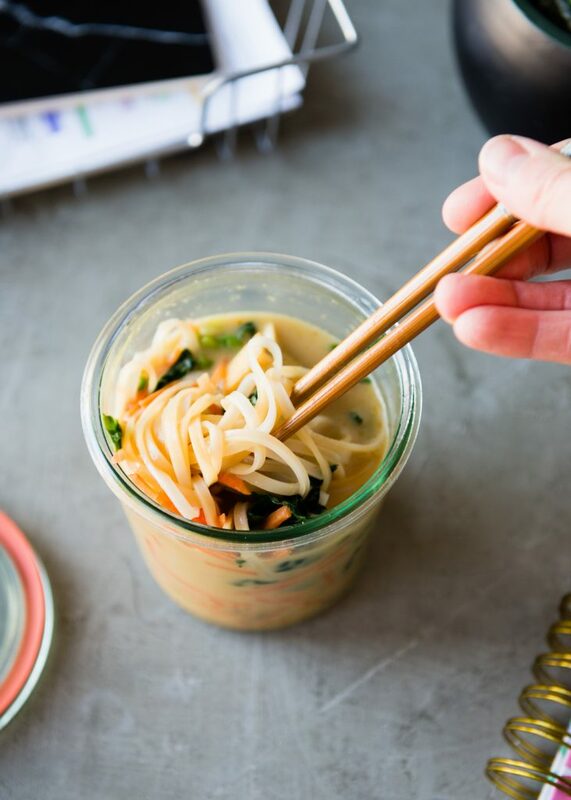 In a pint (16-ounce) canning jar or another container with tight-fitting lid, layer the softened noodles, kale ribbons, shredded carrots, tofu, and sliced green onion. Gently press down as you layer so there is enough room for all of the ingredients. Add the curry paste, tamari, and coconut cream to the jar. Seal the jar or container. Refrigerate until ready to use. To prepare: Pour 3/4 cup boiling water into the jar. Replace the lid and let stand for 5-7 minutes to allow all of the ingredients to heat up. Open and stir well, then eat! Notes: -For more flavor, 3/4 cup broth can be used in place of the water when preparing the noodles.--For extra crunch, add 1-2 tablespoons chopped peanuts or cashews after adding the hot liquid to the jar.-Thai curry paste comes in several varieties - yellow, green, panang, red, and massaman. It can be found in most grocery stores in the Asian section, or in specialty markets. I used yellow curry paste, which is vegetarian. Use whichever you can find or like best. The different kinds of paste will vary in spiciness, so if needed, start with 1 teaspoon and add extra to taste.-Rice sticks or pad Thai noodles can also be found in the Asian section of most grocery stores or in specialty markets. They come in S, M, and L. I used M for this recipe.-This recipe makes one jar. Feel free to make 5 times the amount so you have enough for the whole week. If you prefer a larger lunch, double the recipe and use a larger jar.